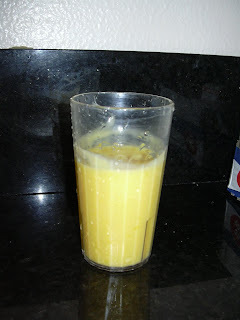 Today I made mango lassi for my buddies. It was really good and here is the recipe. First grind mango once, then add yogurt, milk, ice cream sugar and water and grind it again. Serve it with ice cubes. Enjoy!! If you use fat free milk, then avoid using water and increase the quantity of milk.